Sew Karen-ly Created...: A Happy User! "For my recent birthday, my sister sent me a cheque to buy a treat. Oh, the possibilities of that! But without much hesitation, I decided that a real treat, something very special, would be some of Karen’s thread! I know it is really Aurifil, but in my house it is simply called Karen’s thread. And what does she have in her shop but the new 80 weight, sold singly and in collections. One of the collections was the exact price of my birthday cheque, and a quick email to Karen ensured that I could get what I wanted. 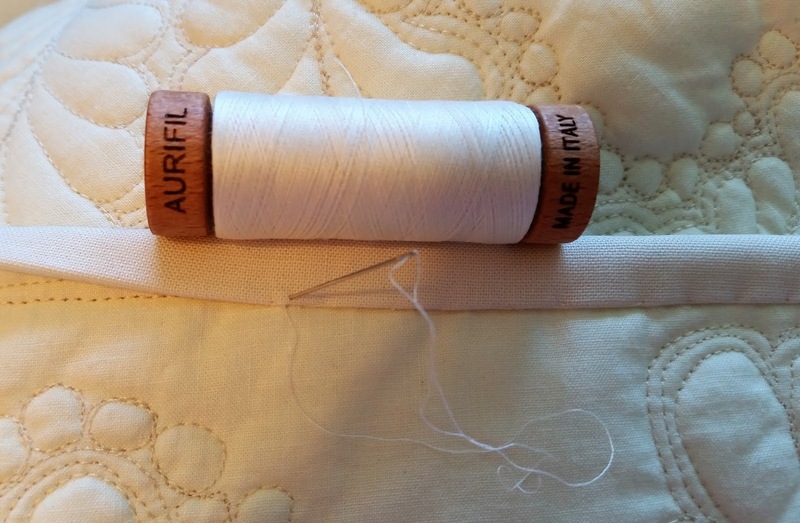 I used this miraculous thread yesterday for the first time. I was making a set of placemats without binding, so I needed to turn them right side out and blind stitch the opening. The thread absolutely disappeared in this three inch closure. I used a colour to match my fabrics, but I think I could have used flaming flourescent pink and the stitches still would not have been visible. This will definitely be my "go to" thread for hand work, especially for hand sewing bindings in place (which I love to do). What a wonderful product. If you have been thinking of giving the 80 weight thread a try, please do it! You will be delighted with it, and will want a variety of colours for all your handwork. Thank you, Karen, for stocking, and promoting, this product. It is a Winner!" And below...you see Jeanne Kaye's beautiful placemats! 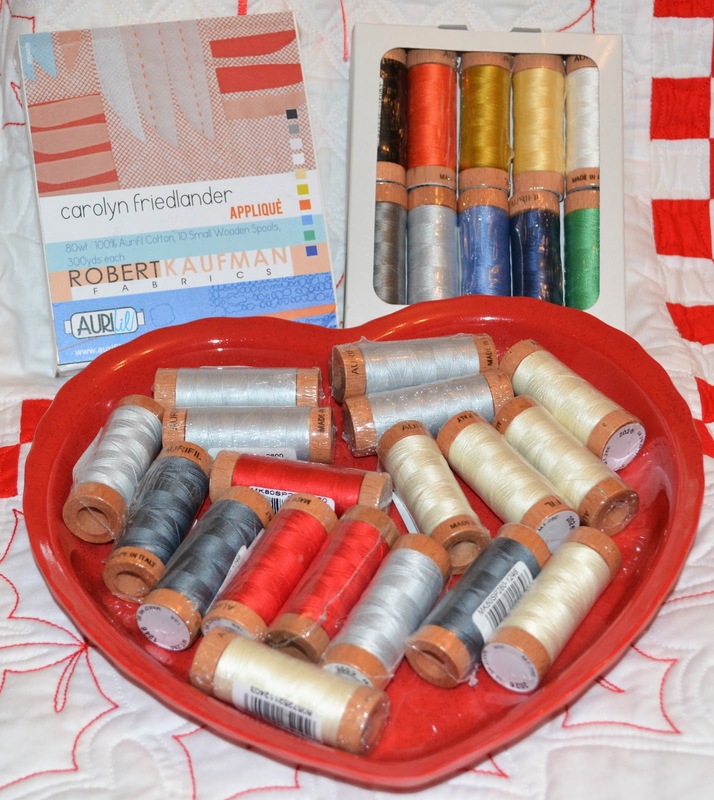 How wonderful is an unsolicited email praising Aurifil! I too have tried the new 80wt. thread for handsewing- stitching down a binding. LOVED it. It truly does just "melt" into your fabric. It'll be my go to for that job from now on, for sure. 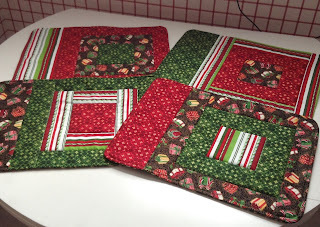 Lovely placemats, Jeanne Kaye! Such beautiful placemats, Jeanne Kaye! And what a great testimonial to your thread, Karen! That’s so sweet, Karen! She was obviously delighted with her purchase to take the time to compose such a lovely testimonial!